Sorry for the little hiatus in blogging for those of you who are following along at home. 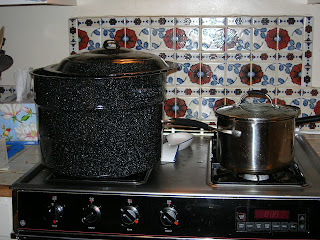 I was canning! I can't believe it. It's like I've entered another era. A galaxy far, far away. I feel like Laura Ingalls' "Ma." I have no idea if they canned on the frontier way back then. Probably not. Anyway, you get the point. In this day and age of fast everything, canning does seem to take a while. Not too long. But, it's much longer than going to the grocery store. On Sunday I found some canning supplies at Rollier's Hardware in Mt. Lebanon. http://www.rolliers.com/ Although it was kind of pricey, they had everything I thought I needed: a big canning pot with a rack or "canner," jars and lids, pectin, wide-mouth funnels, lid lifter, a jelly bag, a jar grabber, even a foley food mill. Canning will definitely not save you money the first year. I'm hoping to break even by year three or four. Anyway, I began by canning a tomato sauce on Sunday. I got the recipe and the method from a very helpful book called Ball Complete Book of Home Preserving: 400 Delicious and Creative Recipes for Today http://www.amazon.com/Ball-Complete-Book-Home-Preserving/dp/0778801314. Of all the books and websites I reviewed, this book explained the method the most clearly to me and offered the recipe for the tomato sauce that I used. On Monday my friend Emily had me over to make raspberry jam. We both used frozen raspberries. Five mashed cups. She made her jars first so I could watch her. She showed me some short cuts, like sterilizing jars in a microwave by inverting them in a tray of water, and pouring boiling water from a tea kettle on utensils and lids. She explained that there is a critical time in the jam/ jelly making process that does not exist with canning other things. The critical time is when your fruit/ pectin mixture comes to a full and rolling boil (and it was good for me to be able to see what a rolling boil looks like -- basically, when the boiling can't be stopped by stirring). You need to dump the sugar in all at once and then when the mixture comes back to a full and rolling boil, boil for exactly one minute and then ladle it in! Another time saver (and energy saver) tip was instead of using a water bath, Emily simply inverted all the filled jam jars for five minutes. Sure enough, we could hear the pop when shortly thereafter, they sealed! And the jam tasted heavenly. Hopefully it won't spoil. Today, all on my own, I made grape jelly. I hope. I have no idea if it's set. It is all jarred and looks nice, but Emily cautioned that when she tried making grape jam it would not set for her. 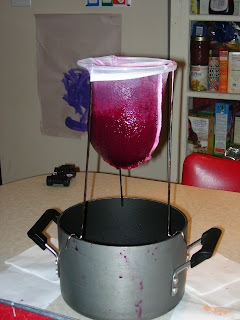 I found a very helpful grape-jelly-making web page. http://www.pickyourown.org/grapejelly.htm It took a while for the jelly to drip through the jelly bag, but I was hoping it would appeal to the picky four year old who has rejected the raspberry jam already because of the seeds. Sigh. On the one hand, I did all the work for the jelly in a three hour period. On the other, I could have bought grape jelly at the supermarket in about 3 minutes. Is it worth it? I think if I can figure out how to do it without sugar, it will be. But that's a project for another day. Just caught up with your blog - I'm enjoying it and you're right, there are others of us around trying to eat locally, not just when it's pleasant and easy (like summer and early fall) but into the winter. Living in the East End definitely makes that easier but that milk problem - yikes. Turner Dairy (from Penn Hills) has sometimes had a table at the Monday East Liberty Farmers' Market and they've offered milk there but that will end when the markets end. They gave me a flyer (which I lost) with a list of stores that carry their milk. I think it was more likely to be pharmacy chains than grocery chains. My favorite Farmers' Market is the Saturday morning one, in East Liberty across from Home Depot. It's a year round market and the meat that Kennedy Farms carries is (I think) Butler County meat, not organic per se but local. Barbara Kingsolver's "Animal - Vegetable - Miracle" gave me food for thought about organic foods. Not always what they're cracked up to be especially when shipped from, say, Oregon.